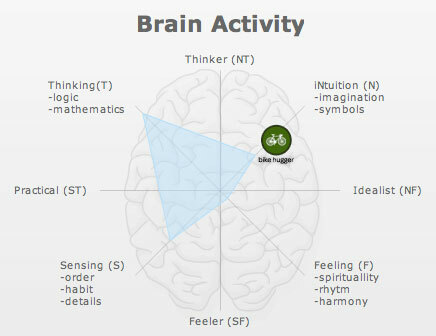 This just in from the fun with blogs department, an analysis of Bike Hugger’s brain, provided by Typealyzer. Cyclelicious plugged in Bike Snob and learned that the anonymous blogger is a mechanic! The graph joins our other informative Degrees of Hugga chart.